The Union Territory of Andaman and Nicobar Islands is known throughout the country as 'Kalapani' because it was a place for penal settlement under the British Rule. The islands lie in a long and narrow broken chain, approximately north-south sprawling like an arc. 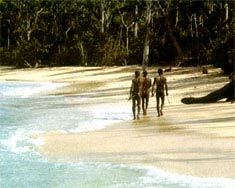 Andaman group of islands and the Nicobar group of islands, have entirely different population and problems. The dreaded 10o channel which is about 145 km wide and 400 fathoms deep, separates the two groups. This territory comprises islands some of which are large such as North Andaman, Middle Andaman, South Andaman, Baratang, Little Andaman in the Andaman group and Car Nicobar, Great Nicobar, Little Nicobar in the Nicobar group. Situated in the Bay of Bengal, Andaman and Nicobar islands constitute one of the most important union territories. This group of big and small picturesque islands forming a narrow broken chain in the form of a north-south arc, are situated at 6oN and 14oN latitude and 92oE and 94oE longitude. Geologically the islands appear to have been part of the land mass of South east Asia comprising North East India, Burma, Thailand, Malaysia and Indonesia. Port Blair, the head quarters of the islands is 1230 kms from Calcutta (by sea), 1400 kms from Chennai, 1278 kms from Visakhapatnam and 580kms from Yangon (Rangoon). This territory consists of two distinct groups of islands-Andaman and Nicobar. There are more than 3000 islands, islets and rocks in the archipelago while only about 300 of them are of appreciable size. Of the total 556 islands, only 37 islands are inhabited. The northern most point is Landfall island which is 901kms away from the mouth of Hoogly River and about 190kms from Burma. The southern-most island is Great Nicobar, the southern-most tip of which Pygmalian Point now Indira Point is about 150kms away from Sumatra (Indonesia). The terrain is generally mountainous with long ranges of hills enclosing narrow valleys. The configuration of the land clearly points to these islands being the visible ridges and summits of sunken ranges of mountains, Saddle Peak in North Andaman at a height of 732 metres above sea level is the highest point in these islands. There are no great elevations and the slopes are moderate to steep and rugged. They are susceptible to heavy soil erosion. Flat lands are comparatively scarce. The villages in Betapur and Diglipur constitute the main flat lands in the Andaman group. 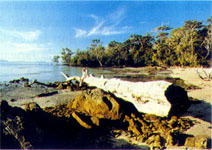 The islands in the Nicobar group are surrounded by coral reef and shallow seas. Long narrow stretches of sandy beaches are a salient feature of the topography here. Car Nicobar and Katchal are almost flat while the others have hilly terrain. In Little Nicobar and Great Nicobar in the Nicobar group, the land surface is very irregular, cut up by steep hills and valleys.